Great news! 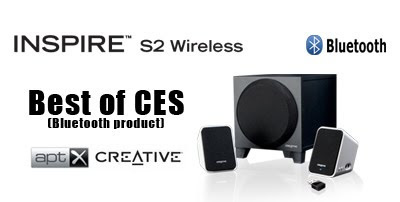 Creative latest wireless speakers - the Inspire S2 Wireless has been nominated for the Best of CES 2010! Out of the 10 finalist, it is the only speaker product to be nominated. The main selling point of the Inspire S2 Wireless is the Apt-X audio codec that is used to stream the music (through the dongle) to the speakers. If you would like to win a set of the Inspire S2 Wireless, all you have to do is to VOTE HERE! 3rd Jan 2010 is the LAST day of voting so hurry!